Introducing my most favorite dish to assemble – August. Isn’t she lovely. 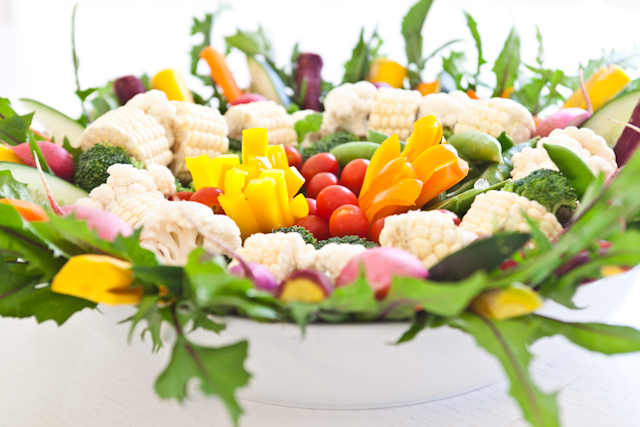 My mom inspired me to make this gorgeous veggie bowl. She was served something like this (on a much smaller scale) at a restaurant in Arizona. She snapped a shot to send to me and waa laa … August was born. We went with all organic veggies but obviously that is a personal choice, choose what fits your lifestyle best. It was a blast to assemble, I know you will have fun too! 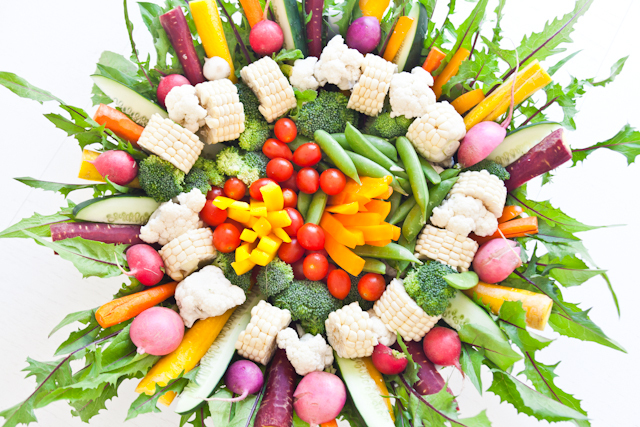 As seen in the picture, display the veggies from large to small, or honestly – just do it messy – its gorgeous that way too! There is no wrong way. I did not give measurements because it really just depends how many people you are making this appetizer for. 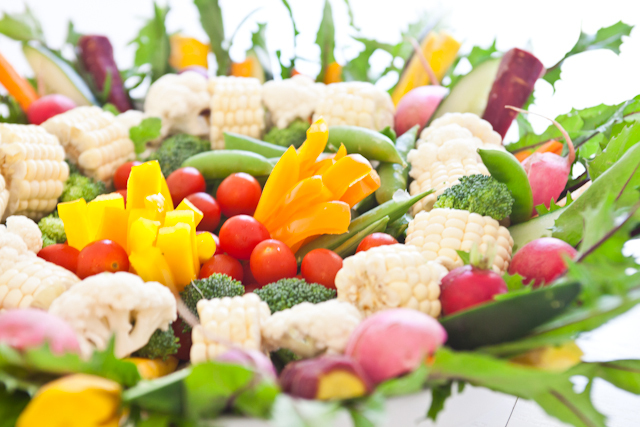 Have fun and enjoy your veggies! This delicious side is a little too simple to call a “recipe” or even a salad… but it’s fantastic and worth posting. 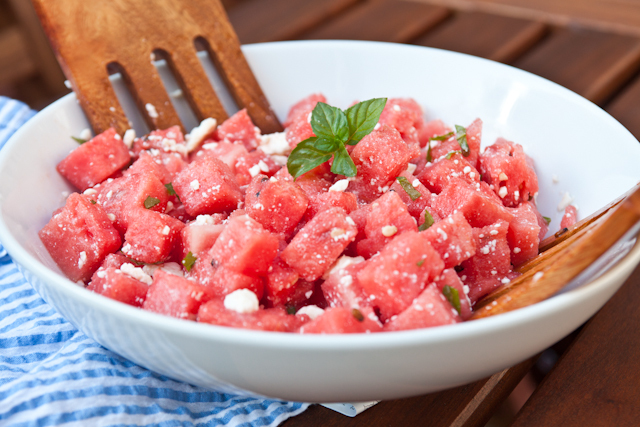 We have been enjoying this in the late afternoons when we need a light and refreshing snack. 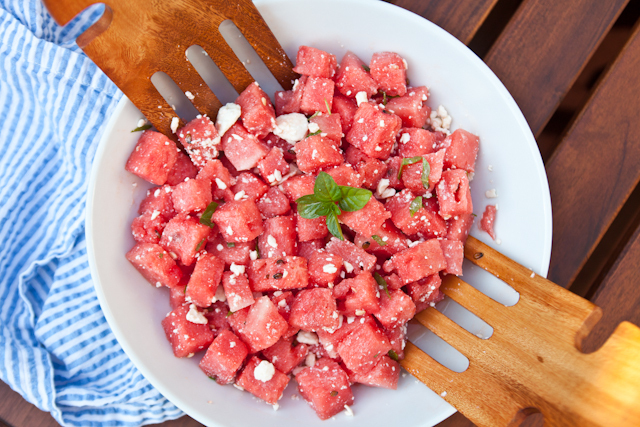 Chop the watermelon, toss in the feta cheese and add the chopped mint leaves. Right before serving drizzle the lemon and honey concoction. Enjoy! 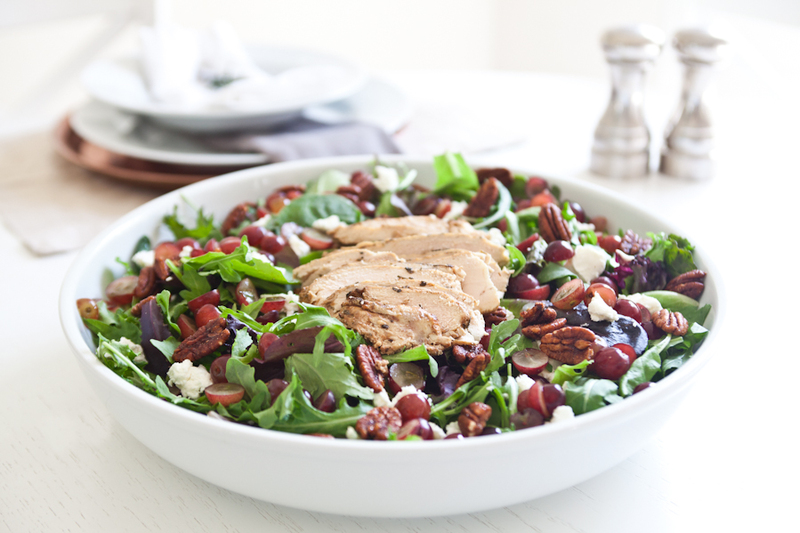 This is one of Rob and I’s most favorite salads. It is beautiful, sophisticated and yet shockingly filling. I love the asparagus and egg combo and the salty pistachios pair beautifully with the avocado. We named this elegant salad after the chic miss joys rose (soon to be Mrs. Groves, which we could not be more thrilled about!) She is as down to earth as one can be, while all the while capturing your heart with her own humble charm. She is lovely and present and just so satisfying to be with. 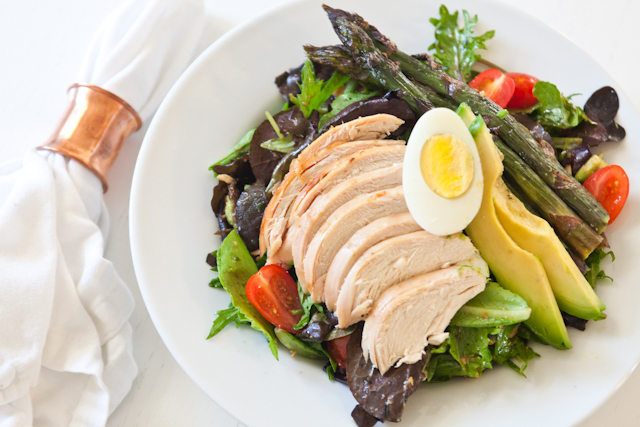 We hope you can enjoy this salad with someone as inspiring as she! My love and his amazing photography skills… I had to post a few extra. Thank you Natalie for the lovely floral arrangements. They made this meal feel a bit more Parisian, which you know I love. The cherry tomatoes give this dish a burst of color. We love rotisserie chicken, it adds such fantastic flavor, is easy to use and we had plenty left over, which allowed for another easy meal. Stay tuned for what the other half of this bird created for the Wang’s this week. To make the dressing, combine all ingredients and whisk. Toss the salad before serving! Enjoy! This salad is named after, my love, Rob. I could write pages about why I love this man so much but I will leave it with this. He is extraordinary. Lord willing, I will spend my lifetime discovering his greatness. This salad is his most favorite. 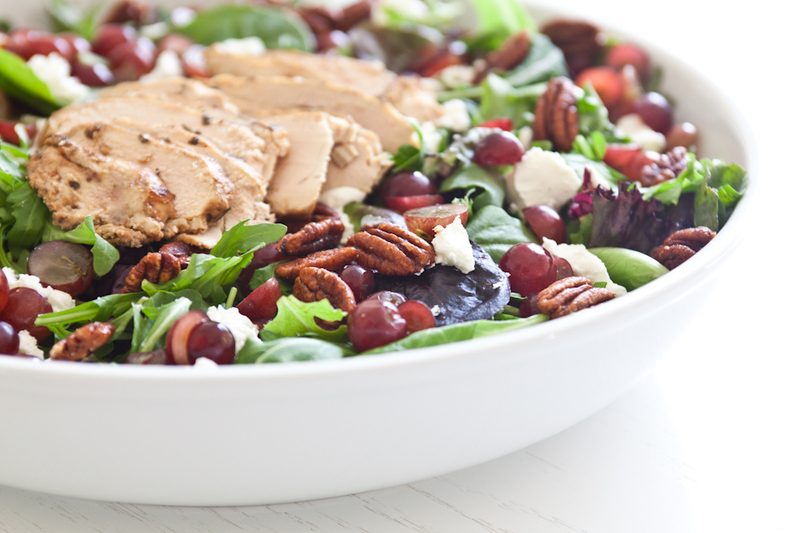 It is filled with sliced grapes, goat cheese, caramelized pecans and rosemary chicken… truly divine, like him. We hope you enjoy! 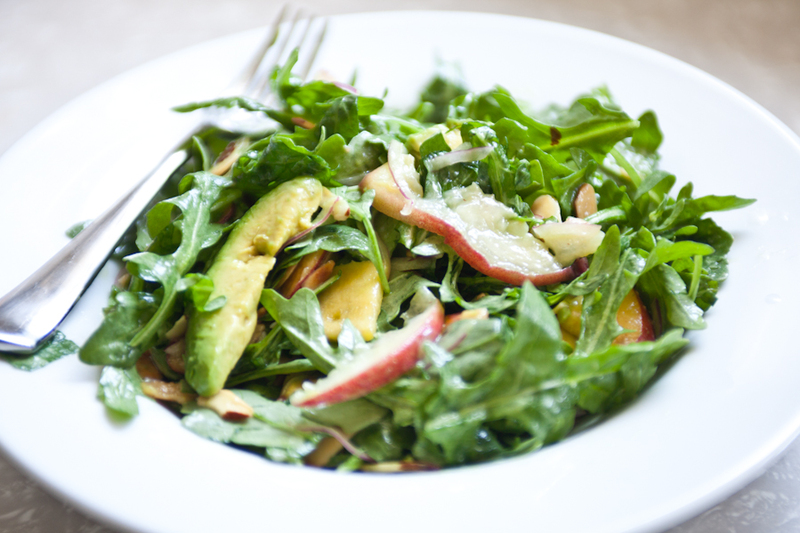 This salad takes minutes to assemble and is quite a crowd pleaser! 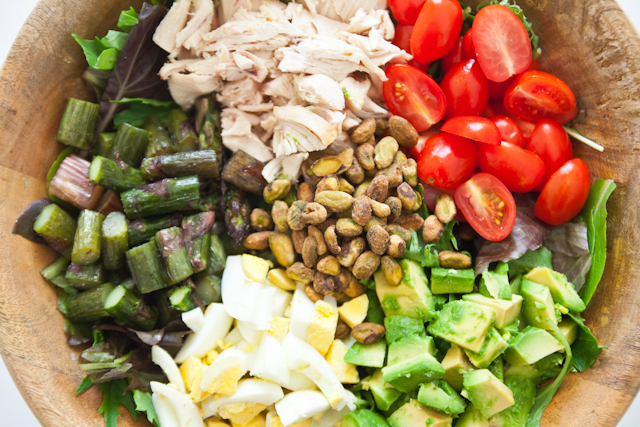 Mix all the ingredients together and toss with dressing. *I buy the already marinated rosemary chicken from trader joes. This is the best option (although you can marinate and grill your own) there are a few reasons that make this wonderful. I use the juice in the package to add to the dressing. This is mostly rosemary and oil (as the chicken has already been cooked so no worries there)…it adds such great flavor to the dressing. 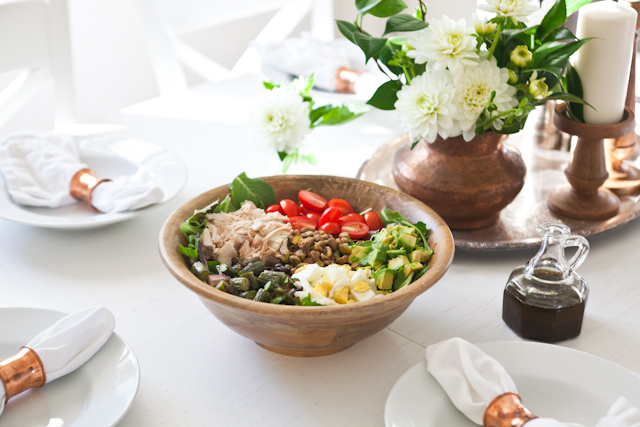 Further, I use the rosemary sprig in the package to finely chop and add to the dressing. One package of chicken feeds 2 as a main dish. Awe…Summer… warm days, sundress, sandy toes (which I actually dont care for) and peaches… the best! “The mee mee” salad is named after my dearest friend, Meehan. She is quintessential “summer”… she comes alive in the sun, she is happiest on the sand and most at peace when things are simple. Meem’s is “California” thru and thru. She is elegant. One of those gals who can be at the beach all day and then throw on a long dress and look knock out gorgeous for dinner. Effortless beauty, this one. I should add that I tried to learn how to tan from her… big mistake…I must have had a moment of forgetfulness on that day, when I chose not to acknowledge that my red headed genes and milky white skin don’t exactly bronze like her olive goddess bod does… hours later, she looked more like a model (if at all possible) and I needed an aloe bath… for about three days. In any case…Time spent with her is like a dream… you just don’t want it to end. 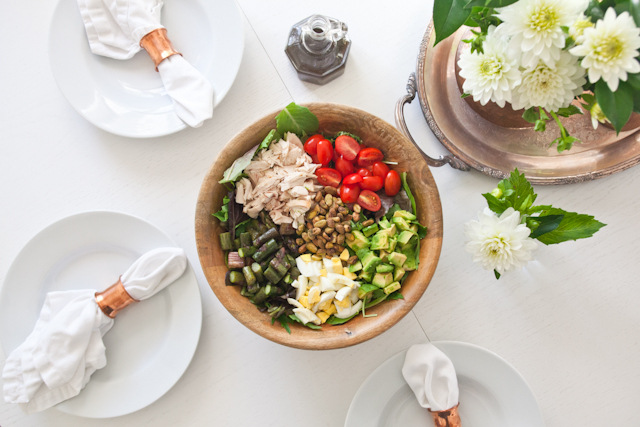 After a lovely Saturday morning, Rob and I picked all the finest summer goods from local farmers at our market and came up with this delightful salad. Summer in a bowl really. It is so satisfying and very very delicious. 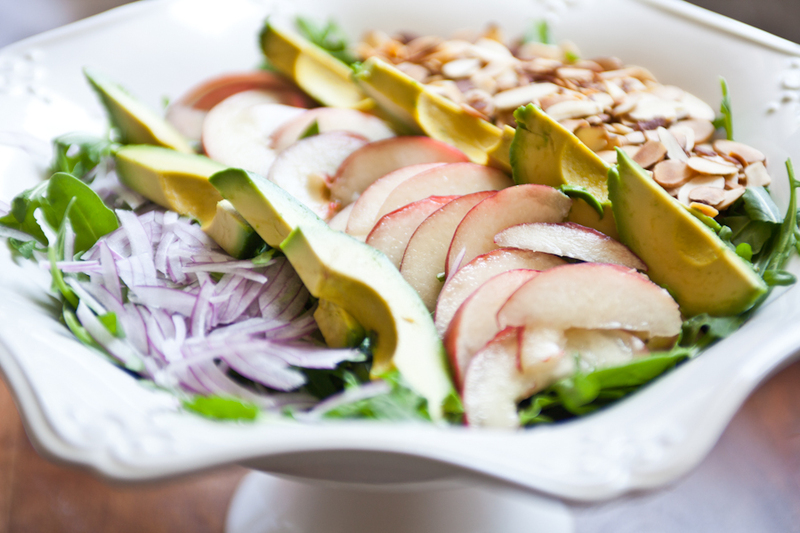 I hope you make this salad and share it with someone as lovely as my dear mee mee.